We are proud to be signatories to Scotland’s Resource Sector Commitment. This voluntary agreement sets best practice standards for organisations operating in the resource management industry. As well as demonstrating our commitment to delivering our customers the highest quality of resource management services, it shows that we actively support Scotland’s zero waste ambitions. 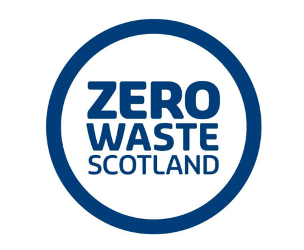 We are committed to working with Zero Waste Scotland to promote continuous improvement, excellent customer service and support to enable your business to reduce waste and improve your resource efficiency. High-quality recycling services supported by clear communications consistent with legal requirements and good practice. Responsive management and continuous improvement based on your feedback. Grant Morgan of Glasgow Computer Recycling is presented with his Zero Waste Scotland certificate by their director Iain Gulland. 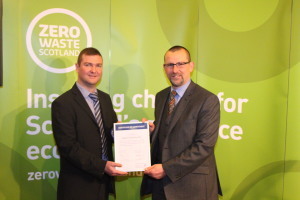 Here at Glasgow Computer Recycling we are delighted to announce that we have been certified as meeting the requirements for Zero Waste Scotland’s Resource Sector Commitment. This is a a Scottish Government backed initiative designed to set consistent standards for business waste collections and to help deliver the country’s zero waste targets. We have been checked out by Zero Waste Scotland and this shows our commitment to providing high quality waste collection services while promoting the reuse of redundant IT equipment. Grant Morgan of Glasgow Computer Recycling says, “This is a prestigious award to receive from a Government body that is leading the way in promoting recycling best practice, and we are thrilled that our efforts to provide a high quality secure recycling service have been recognised. We have received suppport from Zero Waste Scotland and it is great that the Government is assisting companies in their efforts to make is easy for businesses to legally, securely and responsibly dispose of their redundant computers and IT equipment”. Have a look at the Zero Waste Scotland website to read more about this.